IWAKI offers a large standard program of polyethylene dosing units. 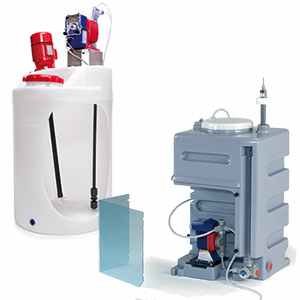 These dosing units provides a safe solution at a reasonable price. The IWAKI dosing units consists of an IWAKI dosing pump, a tank and optionally a flowmeter and a mixer. Additionally a pump can be connected for filling / draining the tank itself.